Cloud Backup and Recovery: Why now? Why Cloud? Most companies are so focused on data backup that they often forget “why” they are backing up their data in the first place. Data protection (backup, snapshots, replication, CDP, etc.) is just a means to an end. The end being the ability to restore, recover, and access data that is lost because of human errors, machine errors, malware, or natural disasters. Because of the infrequency of data restores and recoverability, most companies have little experience restoring and recovering data. Since restores and recoveries are always urgent, it is logical to assume that most organizations frequently test their ability to restore and recovery, especially their procedures for a disaster recovery. That is an incorrect assumption. Case in point, recent Information week’s Business Continuity (BC) Disaster Recovery (DR) survey revealed that approximately 38% of the respondents did not provide a real restore and recovery test at all; 36% ran through a representative failover test just once a year or less and updated their documentation; and 26% ran through a thorough failover test at least once a year or more, following all procedures, reviewed what went right, what went wrong, improved their process, and updated all documentation appropriately. IT protects the data 365 times a year. Attend this presentation to learn why the Cloud provides the most efficient and optimal medium to backup and recover your data and why now is the perfect time to invest in a Cloud Backup and Recovery (BUR) solution. 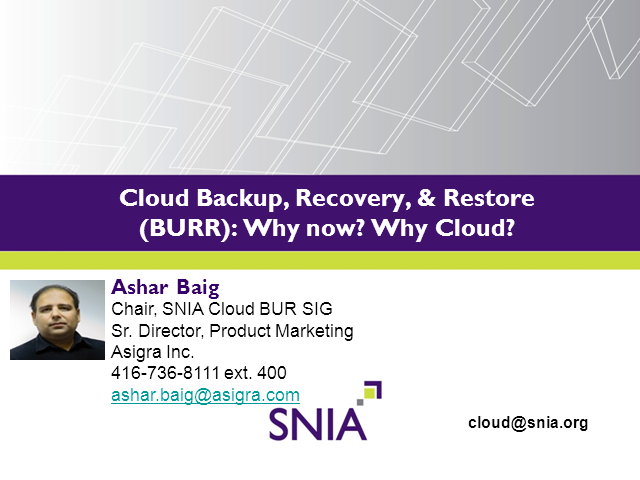 This presentation will review the Cloud Backup market reality, typical errors made with Cloud Backup and future challenges SNIA sees for Cloud Backup and Recovery. Title: Cloud Backup and Recovery: Why now? Why Cloud?